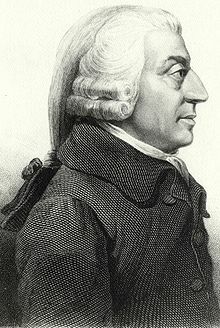 Adam Smith (bapteised 5 Juin 1723 – 17 Julie 1790) wis a Scots economist an screiver o the Wealth of Nations an o the Theory of Moral Sentiment. He wis born in Kirkcaudy. He is kent as the "Faither o Economics" or the "Faither o Caipitalism" an aw. Adam Smith's heid is on the Baunk o Ingland £20 note an the Clydesdale Baunk £50 note. Wikimedia Commons haes media relatit tae Adam Smith (philosopher). This page wis last eeditit on 23 Februar 2018, at 19:43.